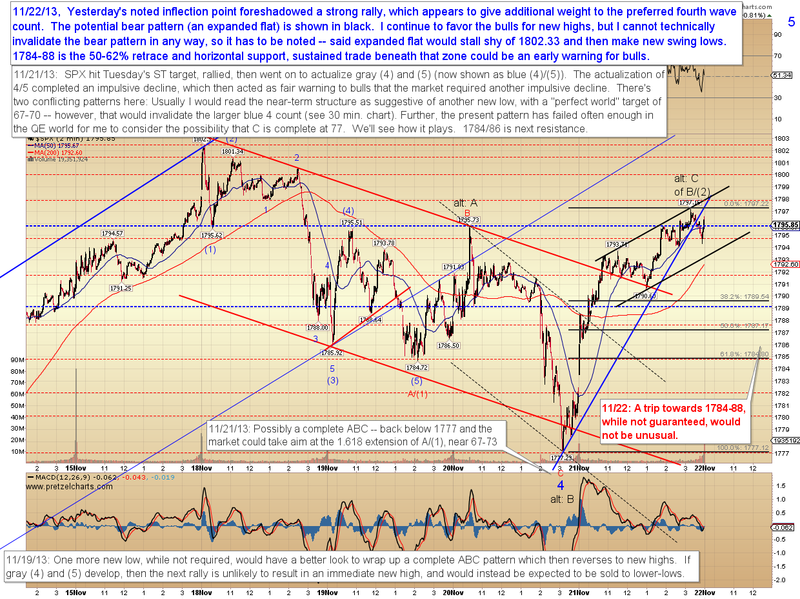 It's always tempting to become complacent after a rally like yesterday's. The preferred bullish wave count appears to be unfolding as anticipated, which makes it easy to forget that there are other patterns still viable. I still favor the bulls, but I'm going to spend most of the article talking about where that projection would be called into question. 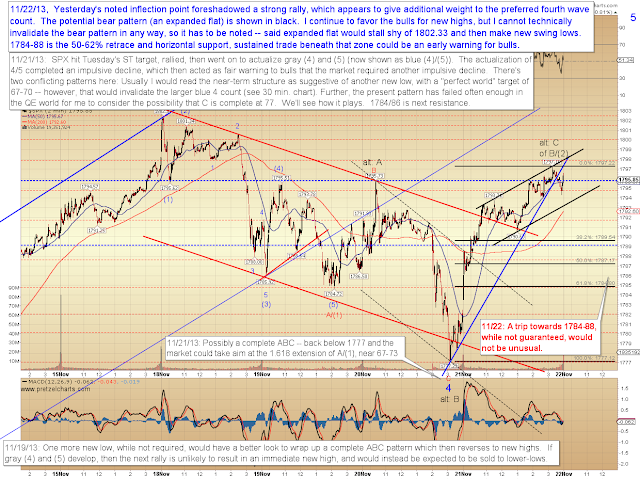 The main option still available to bears is for a repeat of the fractal we saw earlier this month: an expanded flat. The difference is that last time around, I felt pretty confident an expanded flat was unfolding and we'd reverse to new low -- whereas now, I would not put the expanded flat in first place as the preferred count. But I can't rule it out either -- there's just enough ambiguity at the moment to suggest bulls should stay on their toes. The 30-minute S&P 500 (SPX) chart notes the potential for the bear pattern, and the newly-drawn green trend line should serve as fair warning. 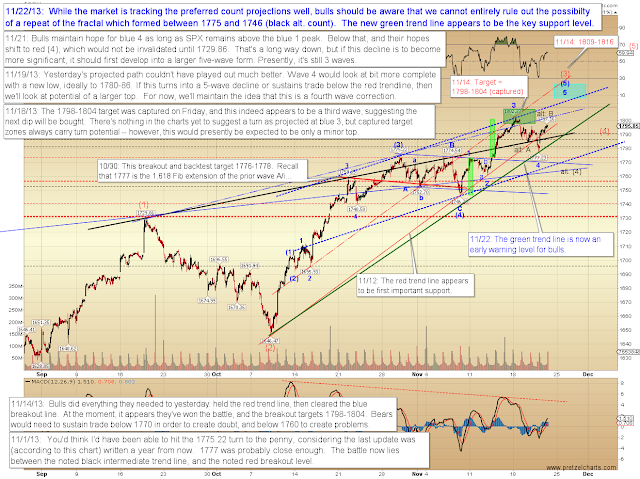 The short-term SPX chart doesn't offer a high-probability near-term count, at least not to my eye. I can see potential for a partial retrace of the rally, but I can also see potential for it to simply run straight up to new highs. I try to offer near-term projections whenever I can, but when the two minute charts look like a coin-flip to me, I don't want to give a false impression -- so I've noted a few levels, and we'll simply have to wait for the market to tip its hand. Note yesterday's successful back tests of both down-sloping trend lines suggests that buyers were anxious to jump on board. 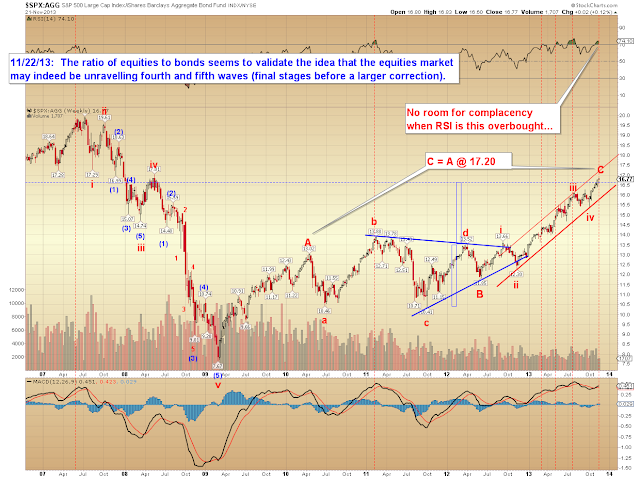 Two-minute chart squiggles aside, the long-term ratio chart of equities and bonds seems to support the preferred count at higher degree, and does suggest the idea that the market is indeed wrapping up fourth and fifth waves. We can see that when RSI has reached similar levels in the past, it has often led to a larger pause or retrace in equities. 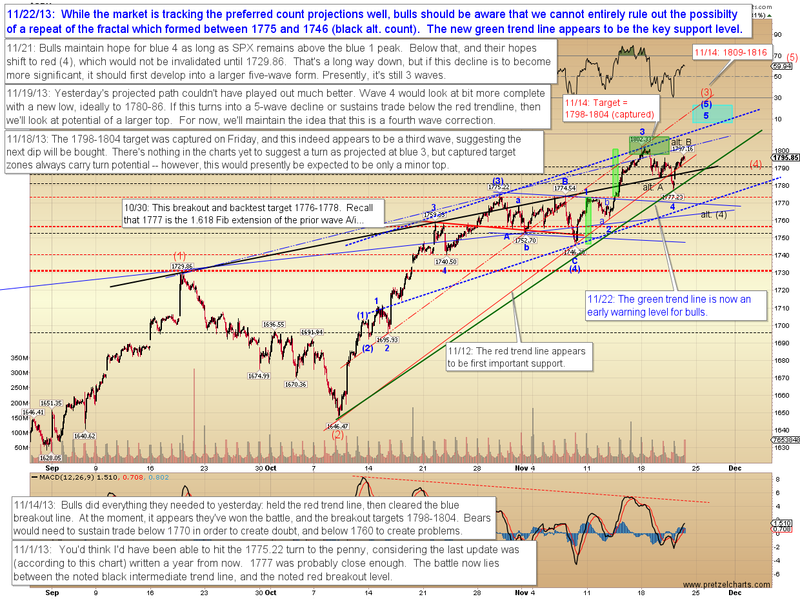 If the preferred count in equities is correct across all degrees of trend, then we're close, but not quite there yet. In conclusion, while I spent most of today's article talking about the bear argument, I would continue to give the odds to bulls for new highs. In the event bears can reclaim the noted levels and trend line, then we'd need to shift odds accordingly. Trade safe.